My latest chunk of open-source code is very simple: MGWordCounter provides live word-counting for NSTextViews on OS X and UITextViews on iOS. Counting is asynchronous (happens in the background). It tries not to count any more text than is necessary. It counts both the full text and any selection in the textview. MGWordCounter uses NSString’s own (excellent) understanding of what constitutes a “word”, and thus will improve as NSString and the text system are enhanced in future. I do a lot of writing, and I find it extremely useful to have a live word-count (and character-count) for the piece I’m working on. 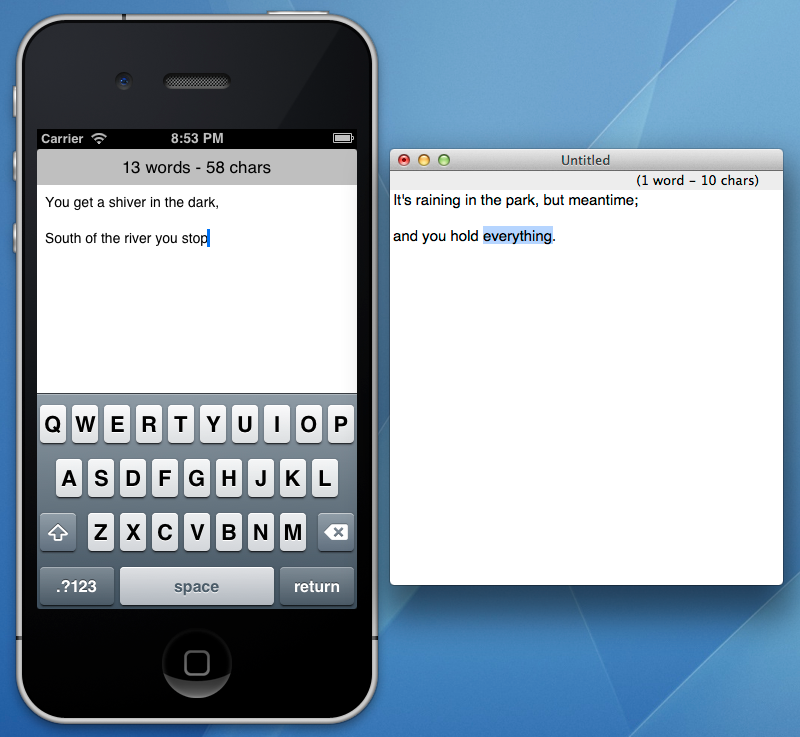 I also like to try out new writing apps and text-editors, and I’d be disappointed if they didn’t have that feature. I thought that the best way to make sure all my favourite writing apps of the future have live word-counting was to implement the feature in a straightforward, drop-in way, then I can just point those developers towards this code. Then they’ll have absolutely no excuse for not implementing it. MGWordCounter is distributed under an attribution license. You’re free to use it, with attribution, in any kind of project you like (including commercial and/or closed-source apps). See the license page for information on using it without attribution too (for a fee). If you require a different license, you’re welcome to contact me. As with all the other OS X and iOS code I’ve released over the years, I’m making MGWordCounter available for the benefit of the developer community. The MGWordCounter project includes simple OS X and iPhone demonstration apps, showing a live word-count display above a text-view. Both apps are separate targets in the same Xcode project. Briefly, you create an MGWordCounter object by initialising it with a suitable NSTextView or UITextView, then you tell the MGWordCounter to start counting. MGWordCounter will then post notifications (and call a delegate method, if you’ve given it a suitable delegate object) whenever the word-count changes. You can also specify a block to be executed. Does it need to be my Text View’s delegate? No. Normally, the MGWordCounter object will be your text-view’s delegate (i.e. its NSTextViewDelegate on OS X, or its UITextViewDelegate on iOS). However, this isn’t absolutely required. If you already have a text-view delegate object, you can simply forward three delegate methods to the MGWordCounter from your actual text-view delegate, and everything will still work. See the comments in MGWordCounter’s header file for more information. Can it work with something other than a Text View? Potentially. If you can fulfil the (NS/UI)TextViewDelegate contract, and the “text-view” object you pass to the MGWordCounter responds to -string on OS X and -text on iOS, then yes, you can presumably make it work for other controls or even more exotic objects. This hasn’t been tested, however. There is absolutely no support offered with this component. You’re on your own! If you want to submit a feature request, please do so via the issue tracker on github (and not via Twitter, email, carrier pigeon, smoke signals or anything else). MGWordCounter is open source code for developers. If you find a bug, please investigate it. There are many NSLog statements (commented-out) throughout the code, allowing you to selectively inspect its workings. The algorithm used isn’t complex. Find out what’s going wrong, and fix it!